On New to The Arsenal we'll look at the signings Arsene Wenger made during the Summer transfer window and look at each individual player's performance and analyse their input into the game. Today Joss Bennett looks at the impact Gervinho has brought to this Arsenal team since his summer move from France. What’s great about Arsenal’s signings this season is the variety; from established mid-table players, finally being given their move to the big-time in Mikel Arteta, to the lost and (hopefully) found in Yossi Benayoun, and raw potential in Alex Oxlade-Chamberlain. 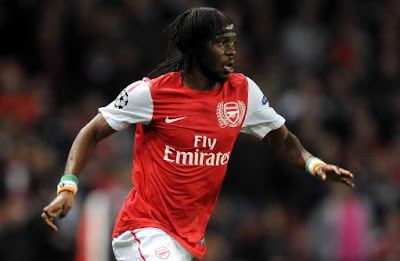 Gervinho is yet another type of signing – not particularly well-known on the International scene (coming from relative small-timers Ivory Coast) and only just starting to raise eyebrows outside of his domestic league before being snapped up for £10.8m by “Le Boss”. You may well notice that the last description is in fact an archetypal “Wenger signing”. And it’s worked – again. Gervinho’s basic stats show an impressive two goals and five assists in just eight Premier League appearances*. Despite the Ivorian winger’s admittedly inconsistent start, there has been clear evidence recently of improvement; in his last six games in all competitions, he has failed to register an assist in just one – the 0-0 draw against Marseille*. While there has been clear improvement, it’s important to note for easily frustrated fans that there is no guarantee that Gervinho will provide constant entertainment during a match – despite his impressive goals and assists record, he has a relatively average 6.9 rating from WhoScored. What the Ivorian will bring, however, is hard work and determination. Gervinho has become quickly attuned to the fact that patience is a virtue and that if he puts enough crosses into the box, one of them is bound to end in a goal – especially with the in-form Robin van Persie looking to get on the end of them. Since hitting out on his debut at the match’s antagonist Joey Barton, Gervinho appears to have learnt not to get frustrated. If we compare arguably his worst game of the season; the 0-0 draw at St. James’ Park on the first day of the season, with his best; the 3-1 win over Stoke City, we can see obvious comparisons. Against Newcastle, he attempted five crosses – finding his target with one, and misplaced ten passes in the final third before the red mist descended and he was sent for an early bath. By comparison against Stoke he attempted four crosses (completing none) but misplaced only four passes all game and grabbed two assists late on in addition to his 27th minute goal**. But Gervinho does have the ability to excite the crowd during games – his willingness to look down the line and try to beat his man is something Arsenal fans have barely seen since the days of Thierry Henry and Frederik Ljungberg. While the former Lille man’s predecessor at Arsenal Samir Nasri certainly had his own bag of skills, it’s Gervinho’s directness that has been welcomed with relief from the Emirates crowd – averaging 2.5 successful dribbles per game, two key passes per game, and 1.9 shots per game*. Somehow, almost every Arsenal player seems to have hit a superb run of form at the same time – as Arsenal fans, we’re used to seeing one or two players constantly dig us out of tricky situations, but this season it appears to be different. Since the sales of Samir Nasri and Cesc Fabregas, all of the players seemed to have taken extra responsibility on themselves – our new signings, in particular, have shown an eagerness to impress and work hard. Gervinho is no exception to this rule and, going on his performances so far, Arsene Wenger seems to have found yet another gem from the French leagues. If he can keep up this level of performance, he may well turn out to be one of the best signings this season. **Statistics and chalkboards courtesy of The Guardian.